To get the best results…you've gotta have the right gear. The Guide Gear Universal Full-surround Enclosure gives you the total concealment you need to turn your tree stand into full blown hunting headquarters. In just minutes, your vantage point will be cloaked in camo, ready to keep you hidden from whitetails and other trophy game. Dimensions: 3'9" x 4'4" x 5'2"h.
Guide Gear Universal Tree Stand Blind Kit is rated 4.1 out of 5 by 211. 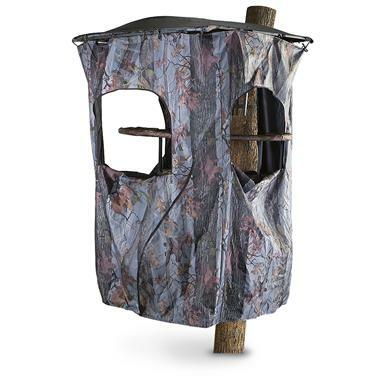 Rated 3 out of 5 by oklahoosier from It'll Work Bought the kit mainly because we needed the fabric to replace worn out fabric on an existing tower blind. Camo pattern worked for us but know it is not a pattern from the top brands many are familiar with. The fabric itself kept out what rain we had. The ties on the fabric are thin, short and not sewn well. The back of the fabric uses the skimpy ties to close it. That said they did hold up in all the weather we had our first year. The door entry zipper is a tight fit for an average size hunter dressed for even mild weather. By cutting the elastic cord running around the bottom of the fabric and modifying how it secured the door was made wide enough to enter without much difficulty. The three windows are good sized and zippers worked fine. Used the metal framework to raise the roof height and widen it. Not how it was intended to be used but the metal enabled modifications that improved the stand's comfort. I can't comment on the assembly instructions or the product's intended use because this kit wasn't used as stated. We removed the fabric for the off season to prolong its longevity. Rated 5 out of 5 by none from good price ! 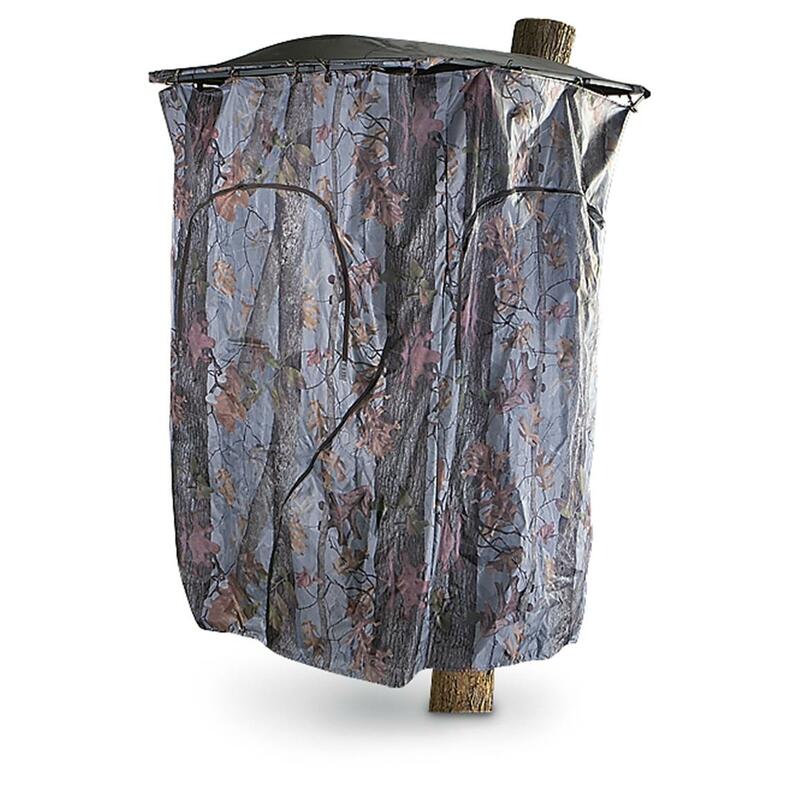 out standing blind using it has a ground blind! Rated 3 out of 5 by Jeff from Good price I believe that they should have put the velcro under the roof for it to work better but it is better than nothing. Rated 3 out of 5 by Tommy T from Good Concept / Poor Construction This is a great concept item. On the positive, the rail system was solid! However the blind material was poor quality, and the workmanship was bad. (i.e. two of zippers on the window ports were sewn in backwards so you cant open them from inside. The roof corners were also sewn in improperly. I hope to get a replacement from SG. Since there are not alot of similar blinds at this price point I would probably recommend the item with the "Made in China" warning. Happy Hunting!